Throughout the years, Sharon has woven her diverse educational, vocational, and personal background to realize her life-long passion toward helping others achieve thriving and purposeful lives. As a Professional Lifeskills Coach, Consultant, Speaker, and Writer she combined her unique abilities in Lifeskills, Wellness, and Creative Arts Development. During her childhood years, Sharon’s father was a division administrator for Paramount Studios. She was always curious to see and meet the performers and actors whenever she got a chance. Her own creative bent shadowed her whenever she would be drawing profiles of students in her class instead of learning her math tables or the physiology of a frog. There were also other shadows of childhood that were a painful preamble of what was ahead for her. By the time Sharon was a young adult, she was already actively involved in the creative arts, crafts, and poetry. She also developed her business skills along the way, just in case “art” didn’t provide enough income to live on. Yet, Sharon was fortunate to be hired as a program manager of a university arts/crafts center after achieving her BA degree in art and minor in business. 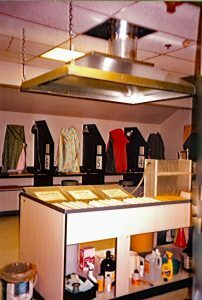 She also advanced her skills as a commission artisan in jewelry fabrication and the fiber arts for individuals, galleries, and interior design companies. After her tenure in California, it was then time to move to South Texas. 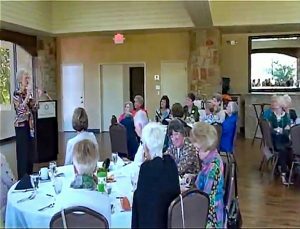 As Sharon was adjusting to friendly South Texas life, she was also having a growing desire to share her skills with others, whose lives may be limited in some way. . .to experience the joy in creative expression all their own. After she finished her masters degree in art, she completed a wellness seminar and was then trained as an Activity Director Instructor for nursing homes. 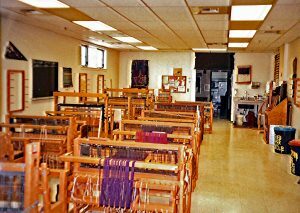 Sharon was able to share her joy and expertise in the crafts as an instructor and consultant. Her longing was to help raise the bar of skill for activity director trainees and provide a range of creative ideas within a nursing home setting. Throughout her experience, she came away with a profound respect for the profession. Unaware at the time, Sharon’s encounter with our nation’s healthcare system as an Activity Director Instructor was just a preamble to her own personal journey toward wellness. As life always has its twists and turns, Sharon entered a whole new adventure. During the course of moving from California to Texas, various ailments began to surface but were initially ignored. During the next two years, she found her health progressively deteriorating for inexplicable reasons. The pain was continuous, and life was becoming a seemingly unsolvable mystery. Sharon came to a stop! As she journeyed to solve her many “medical mysteries”, Sharon began to discover a whole new life of faith and hope. Every day became a brand new day filled with challenges and opportunities…and a deeper passion entering her life. Sharon’s new journey took her through a cascading list of infirmities and diagnoses, the shadows and secrets of childhood abuse, and the meandering maze of conventional and alternative medicine. As she looks back on her odyssey to solve those medical mysteries, Sharon was challenged to look at life’s horizon with a broader stroke—one life forever changed by her faith in God, the impact of family on her physical, emotional, spiritual wellbeing, and the healing miracle of forgiveness. From her own personal odyssey, Sharon sought to more deeply understand our spiritual nature and its impact on people’s lives and relationships. She pursued an extensive two-year training program at Elijah House to be certified as a Prayer Ministry Counselor. 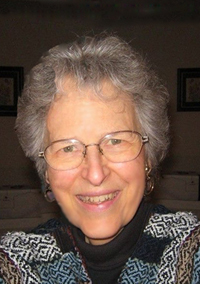 Combined with her proficient business skills, she then pursued training at the Therapon Institute and board certification with the American Society of Christian Therapists. Sharon established herself as a Lifeskills Consultant/Belief Therapist helping people bring order out of chaos in their personal lives. With her diverse educational, vocational, and personal background, Sharon completed an extensive training program with the Institute for Life Coach Training. In addition, she completed certified training as a wellness coach with our nation premier school, Real Balance Global Wellness. As an ICF certified professional Life & Wellness Coach, she combined her uniquely designed skill sets to help make real-life changes in people’s lives. Transformation and Celebrating the Journey happens one person at a time taking forward action and living their life purpose, both professionally and personally. 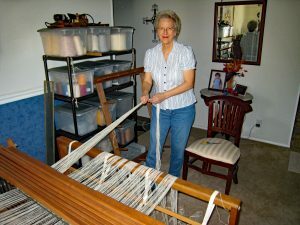 Today, Sharon enjoys sharing her lifeskills and wellness journey as a writer/author, fiber artist/weaver, and web creator. What a combination and l oving it all! She continues utilizing her coaching skills on a referral basis from colleagues and friends. As part of her ongoing endeavors, Sharon has written for an integrative journal, Integrative Medicine, A Clinician’s Journal from a wellness coach’s perspective. Her own story, Daddy’s Eyes offers a chronicle of her wellness journey. 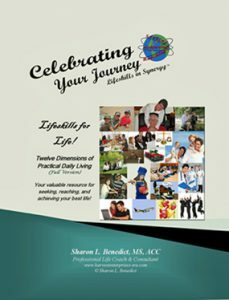 Sharon’s Celebrating Your Journey, Lifeskills in Synergy is also available. CYJ is an invaluable self-paced, hands-on journal for anyone who wants to bring synergy to their everyday routines and life dreams and goals. Celebrating represents Sharon’s life’s work and resources helping others seek, reach, and achieve fulfilling lives through 12 practical daily lifeskills. Her publications are available at most any online bookstore. To celebrate life and have those experiences in her life become “a door of hope” for others, professionally and personally. To be her husband’s life partner…enjoying together the opportunities and challenges life brings our way. To delight in seeing her lovely daughters experience life at its fullest…to offer friendship each day, counsel when asked, and her unconditional love throughout their lives. To leave a legacy of hope, faith, and love.